The Science Fiction and Fantasy Writers of America (SFWA) is pleased to announce that Toni Weisskopf has been named the recipient of the Kate Wilhelm Solstice Award to honor her activities in support of science fiction and fantasy. 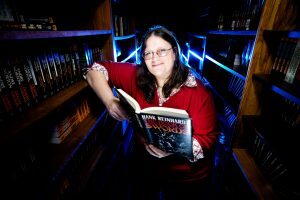 The Kate Wilhelm Solstice Award is given by SFWA for distinguished contributions to the science fiction and fantasy community. Ms. Weisskopf joins the ranks of previous Solstice Award winners, including Octavia Butler, James Tiptree, Jr., Tom Doherty, Carl Sagan, and Stanley Schmidt. The award will be presented at the 52nd Annual Nebula Conference and Awards in Pittsburgh, PA May 18th-21st, 2017. In addition to her current role as Baen Books editor and publisher, Ms. Weisskopf compiled Greasy Grimy Gopher Guts, along with Josepha Sherman, a collected of subversive children’s folklore. 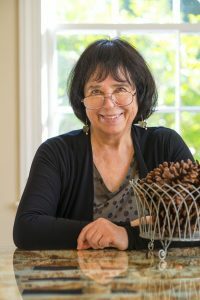 She has edited several anthologies of science fiction, including Cosmic Tales: Adventures in Far Futures and Cosmic Tales: Adventures in Sol System. Ms. Weisskopf has also been active in the fannish side of science fiction, co-chairing DeepSouthCon 50 in 2012, publishing the fanzine Yngvi is a Louse! And Other Graffitos, and serving as the official Editor of the SFPA, the Southern Fannish Press Alliance, and editing an history of Southern Fandom for the Southern Fandom Confederation. Ms. Weisskopf joins Peggy Rae Sapienza, who was previously announced, as a recipient of this year’s Kate Wilhelm Solstice Awards. ​The Nebula Awards will be presented during the annual SFWA Nebula Conference, which will run from May 18th-21st and feature a series of seminars and panel discussions on the craft and business of writing, SFWA’s annual business meeting, and receptions. On May 19th, a mass autograph session will take place at Pittsburgh Marriott City Center and is open to the public. The Science Fiction and Fantasy Writers of America (SFWA) is pleased to announce that Peggy Rae Sapienza has been named the recipient of the Kate Wilhelm Solstice Award to honor her activities in support of science fiction and fantasy.The Kate Wilhelm Solstice Award is given by SFWA for distinguished contributions to the science fiction and fantasy community. Sapienza joins the ranks of previous Solstice Award winners, including Octavia Butler, James Tiptree, Jr., Tom Doherty, Carl Sagan, and Stanley Schmidt. The award will be presented at the 52nd Annual Nebula Conference and Awards in Pittsburgh, PA May 18th-21st, 2017. If anyone was born into science fiction, it was Peggy Rae McKnight (1944-2015), whose father, Jack McKnight famously missed most of the 1953 Worldcon because he was creating the first Hugo Award trophies. She attended her first science fiction convention in 1956 and met her first husband, Bob Pavlat at her first Worldcon in 1960. Over the years, Sapienza was active in fanzine fandom as well as convention running. At Constellation in 1983, she and Pavlat received the Big Heart Award, shortly after Bob died. Science fiction wouldn’t release Peggy Rae. Active in local convention running, she also worked many Worldcon press offices and created the modern Worldcon fan concourse. In 1998, she chaired Bucconeer, the Baltimore Worldcon, and the following year married John Sapienza. She was proud of her role in Nippon 2007, the first Japanese Worldcon. In 2012, Sapienza was named a Guest of Honor for Chicon 7, that year’s Worldcon. She also co-chaired the 2014 World Fantasy Convention before her death in March of 2015. The Peggy Rae Sapienza Endowment at Northern Illinois University is named in her honor and helps support the SFWA Collection at the library. During the 2000s, she became active in helping run events for SFWA, including the New York Reception and the Nebula Weekends. She co-chaired the 2010 Nebulas in Cocoa Beach and then chaired the Washington Nebulas in 2011 and 2012. She continued to help SFWA run its events and publish its magazine until shortly before her death. SFWA will announce a second recipient of the Kate Wilhelm Solstice Award on January 31st. The Nebula Awards will be presented during the annual SFWA Nebula Conference, which will run from May 18th-21st and feature a series of seminars and panel discussions on the craft and business of writing, SFWA’s annual business meeting, and receptions. On May 19th, a mass autograph session will take place at Pittsburgh Marriott City Center and is open to the public. Starting with this May’s Nebula Awards Weekend (Pittsburgh, May 18-21, 2017), autographed trading cards that feature science fiction authors will be given the same stellar treatment that has traditionally been afforded to collectible cards that feature sports stars, music icons, or idols of the film & television industries. Beckett Grading Services–the worldwide authority on authenticating and grading rare and valuable sports collectibles, like the 1952 TOPPS Mickey Mantle rookie card and the 1909 T206 Honus Wagner tobacco card–now accepts the Walter Day Collection of Science Fiction Historical Trading Cards for grading as investment-grade collectables. Yes, the science fiction trading cards that you have seen Walter Day handing out as free gifts at the recent Nebula and Hugo Awards Ceremonies are now poised to become investment-grade collectibles over time. Especially when Beckett authenticates and grades the autographs placed on them. Founded in 2015, the Walter Day Collection of Science Fiction Historical Trading Cards now approaches the release of its 100th unique science fiction history card and plans to present them all in May at the 2017 Nebula Awards Weekend and at the 2017 WorldCon in Helsinki, Finland (August 9-13, 2017). 2016 Nebula nominations are now open! A work may be nominated by an Active, Lifetime Active, Associate or Lifetime Associate member (with no fiduciary interest–which means, not the writer, not the editor, the agent, publicist,) during the nomination period, which runs November 15 of the eligibility year through February 15 of the following year. An author doesn’t have to be a member of SFWA in order for her work to be considered. The six works in each category with the greatest number of nominations become the finalists for the Nebula Awards for that year. The Nebula Awards Showcase volumes have been published annually since 1966, reprinting the winning and nominated stories of the Nebula Awards, voted on by the members of the Science Fiction and Fantasy Writers of America (SFWA). This year’s Showcase celebrates fifty years of the awards. 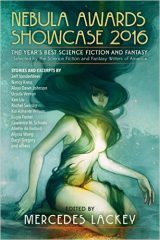 The editor, selected by SFWA’s anthology Committee, is American science fiction and fantasy writer Mercedes Lackey. This year’s Nebula winners are Ursula Vernon, Alaya Dawn Johnson, Nancy Kress, and Jeff VanderMeer, with Alaya Dawn Johnson winning the Andre Norton Award for Young Adult Science Fiction and Fantasy Book. There was a free and open to the public Mass Autographing Event sponsored by Tor Books. 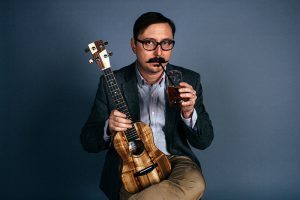 John Hodgman is the longtime Resident Expert on The Daily Show with Jon Stewart and the host of the popular Judge John Hodgman Podcast. He has also appeared on Conan, The Late Late Show, @midnight, and This American Life. The Village Voice named his show RAGNAROK one of the top ten stand up specials of 2013 and in 2015 toured his new show VACATIONLAND. He has performed comedy for the President of the United States and George RR Martin, discussed love and alien abduction at the TED conference, and voiced the Father and Other Father in the film Coraline, and now he wants to talk to you.